NOTE: everything may and will change, this is just to give a flavour of where we might end up. An epic strategy battle game where the player attempts to control and manage numerous territories on a grand world scale. The inevitable battles for control are played out in real time on huge maps within each territory. Using the resources at his disposal, the player must build, maintain, defend and develop each territory's city. As his empire grows, the player can use facilities within the cities to build customized and unique armies with which to wage war. Set in the same universe as starscape the action takes place on a far off colony world called Helios. A planet enslaved by greedy corporate dictators to feed Earth's insatiable appetite for natural resources. Old corporate rivalries can spill over into all out war as mega-corps fight for control of territory and the rich Terran supply contracts. All hell breaks loose when mankinds worse nightmare - the Archnid break free of the grid dimension and an inter-stella war explodes. Caught in the crossfire Helios is cut off and isolated from Earth. Alone for the first time and with little technology of their own the great corporate houses of Helios wrestle for control of the planet. Set many years after the return of the Aegis the D-drive was seen as the key to the stars and the solution to Earth's many problems. After expanding into the solar system to access new energy sources Earth was still struggling with pollution, overcrowding and an energy crisis, all of which made life very hard for 90% of the population who lived in poverty. Ignoring the possible threat of the Archnid, D-drive powered colony ships were created and sent out to look for new worlds to colonise (and exploit). Helios was one of the first, a planet rich in natural resources. Hundreds of thousands of colonists volunteered to start a new life on the planet. Their dreams of a eutopia crushed as Earth licensed governorship of the new world to a council of 7 mega-corporations with the assistance of a Terran "peace keeping" military force. The colonists took a one way trip to a life of hardship working the mines and operating the forges that ran 24hours a day supplying Earth. Colonists could never return to their homeworld and access to information and techology was severly limited, ensuring Helios would always remain subserviant to Earth. Even the great houses that controlled the planet weren't trusted with advance tech templates (programs used by the forges to make anything you want). After the Archnid emerged from the grid, war raged across the galaxy finally coming to the Helios system. Dreadful engines of war equipped with D-drives engaged in a titanic struggle that spanned both grid space and real space. In the midst of the fighting new dimensional super weapons were activated and when one became damaged something unexpected happened. A cascade effect amplified its destructive power ten thousand times, destroying every unit on both sides, damaging the local wormhole access and destroying the moon orbitting Helios. The planet was ravaged by earth quakes, tidal waves and meteorite impacts for days afterwards. All space based technology was vapourised and there was no way to establish contact with Earth. In the weeks that followed the council waited for a relief mission from Earth to arrive. It never came. One thing that you may want to consider is letting a "trickle" of Archnid forces make it to the planet. That would open a few doors for you. For example, in Starscape you captured useful "stuff" when you destroyed certain units. This would be a way to introduce some advanced technology that Earth was keeping back. And who's to say that a lone Xarth (sp?) drone wanders by. (And what about the original aliens? If it's been less than a hundred years then they should be ... somewhere.) In any case, the actual return of the Archnids may not be until the second half of the game. Perhaps they might play a similar role in BattleScape as the worms did in StarScape. If D-drive travel is not an option, what about normal space travel? Would there be "stuff" to discover/rescue/destroy? 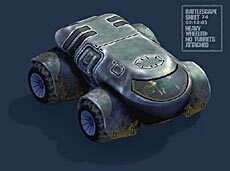 Would something like the Starship Troopers (TV) dropship be an option? Perhaps it would be something you could load several APCs and a handfull of other vehicles. Or, is local space too messed up for anything smaller than a Death Star? 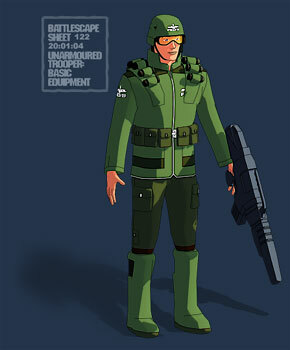 On the other hand, having the option of calling in space-based reinforcements might be interesting. Could you recon force hold out long enough for your drop-pods to land? Another thing to consider is the possibility of orbital installations, or weapons platforms. For the orbital platform, a squadren of fighters to control a portion of space, or as a docking bay for atmospheric fighters/bombers/troopships. If that was the case then the possibility of range limitations can be instituted through fuel usage, so their actual ability to control territory could be limited (no one player being able to dominate the entirety of space or atmosphere with one station). Orbital platforms would be interesting on weapons mix as well as tatical or strategic use. Tatical being perhaps a missle pod, for deployment against a group of hostiles. Strategic could be a pumped up lazer, or "super missle" against a country that would destroy city/infrastructure. An interesting one could be an ion cannon that disrupts manufacturing, com, or power. Lots of backstory, not much on play mechanics. Something I've been thinking of here probably has nothing to do with what you're planning on but what the hey, doesn't hurt to mention. Part of what was neat about Starscape is that you took old-school 80's play mechanics and prettied them up to modern standards, adding just enough on the backend (tech development, exploration) to make it a little something more. You didn't add complexity for the sake of complexity which helped to keep the gameplay fast and interesting. After all, people could play those old 80's coin-ops for hours on end just on account of the play mechanics, they didn't need FMV's and voiceovers and ten tons of empty fanciness to keep their interest! I think the key here is to do your RTS with the same action approach that a good space shooter has. Nixing the whole "take an hour to build a base" thing is a great start to that. Here's an idea on how to take it further from there. Your base on the map will be a well-protected stronghold, much like the mothership in Starscape. Can be destroyed, true, but it takes a lot of killing. Enemy bases will be scattered about the map. There will be manufacturing areas, resource harvesters, refineries, turrets, lots of stuff that can shoot at you but also explode. They'll be cranking out lots of units and trying to attack you. The basic goal you have is to clear out enough of the mobile units so that you can close on the bases and destroy them. Depending on how you perform, what bonuses you get or wreckage you salvage, you can head back to your base and purchase more units which you then immediately take back into combat. Rather than the typical top-down shooter's approach to upgrading a single vehicle to a bigger and badder model, you are increasing your fighting power by adding mutliple vehicles to your platoon, but all of them fighting as an integrated force. Here's what got me thinking about this. Starscape was basically a souped up version of Asteroids/Star Control/Space War. Zone 66 was the same sort of 360 scrolling game vs. large numbers of enemies, but set on a planet. Essentially, the same play mechanics. With Starscape, you fire up the game and are blowing up **** within 30 seconds. That's fun, a very fast rate of play, and so much different from the turgid and plodding approach that most RTS' take to getting into the action. To keep with the Starscape feel, Battlescape really should have that same kind of speed. Now you undoubtably have your own ideas on how it will look and feel and nobody can really make intelligent observations on any of it until the playtest betas are ready. Still, it's definately something to keep in mind. I love how pretty you made the weapons and explosions look in Starscape and would love to see that same sort of good old-fashioned blow-stuff-up-with-ag-grin approach taken here. also, how much do u think the game will cost to get the full version once it's complete? Yea I like the idea that jollyreaper had, but doesn't that sound a little too much like command and conquer?...I mean don't get me wrongthat was a great game but it was already done, so it sounds like old news. Personally, i think if at all possible, Battlescape should be more story, while still being able to move the game along. It sould be more focused on the character that you are, and you have to discover the secrets the government hid from you. There could also be parts where forces join up with you, but this game would be a little more interesting if it basically consisted of one character, like Starscape, and then you advance youself along the road, while helping your people along they way. Oh my, The first post in 1.5 years, Yay for thread necromancy.